One of the largest carousel production lines for the manufacture of precast elements is operated in Röthis in the Austrian State of Vorarlberg. On this line, Nägele Bau produces an increasing share of precast elements conforming to architectural concrete specifications. The company is currently manufacturing the 2,500 pieces of the curtain facade for the new campus building of the University of Applied Sciences and Arts in Brugg | Windisch, Switzerland. For the last eighteen months, Martin Dobler has been managing director of the holding company, which had started out as a conventional construction business. When he began to work for Nägele Bau as a “Prokurist” (authorized representative) and departmental head of precast slightly more than ten years ago, the precast arm of the business was in bad shape. Machines were outdated, and the working conditions in the old, unheated factory buildings were poor. Dobler says that, at the time, the precast production output equaled only about 15% of the current volume. Initially, he began to streamline and reorganize the production process. To get competent support, he hired Dr.-Ing. Jose Colan, a seasoned precast expert. Today, Jose Colan is the manager of the precast plant. The next challenge to be tackled after optimizing production was the refurbishment of the entire factory. A cost estimate showed that a complete factory modernization (with the exception of the existing tilt table unit) combined with the required refurbishment of the existing factory buildings required an investment of about 4 million euros. This amount, however, would have ensured only the then current production volume whilst excluding any further increase. Alternatively, the investment could be doubled to 8 million euros to purchase a completely new production line with a modified layout. Following these initial considerations, both managers adopted a highly methodical approach. They evaluated all existing options and quickly concluded that the factory was to move away from the conventional tilt table systems. They considered a carousel system useful for achieving and ensuring an increased production output in the long term. It took Martin Dobler and Jose Colan almost four years to develop the basic production line concept, which has now been implemented. The detailed design contract, however, was awarded to Christian Prilhofer, a renowned design engineer specializing in precast production lines. Instead of implementing this concept right away, they put it aside for another year and visited many factories across Europe. Moreover, the company was not in need of new premises because the existing site with its extensive storage space was large enough to construct the required factory building. Despite all these positive aspects, the project posed a real challenge in terms of logistics because it was just unthinkable to stop production for all external orders during the conversion period. The business thus benefited from the fact that none of the old factory buildings needed to be demolished. The existing buildings continue to be used for downstream manufacturing steps, such as the acid washing and impregnation of the precast items. The new factory building is 90.07 m long, 48.4 m wide and 14.35 m high. A basement is located underneath the ground-level production areas. Ten openings in the factory floor enable the 16 pallets (each measuring 14.5 x 4.5 m) used in the process to be vertically moved from their ‘above-ground’ production positions to this basement. From there, a fully automated control system moves them in horizontal direction to the required positions while the pallets are supported on roller bearings. This process is fully automated and remote-controlled. The entire production process is stopped immediately if any person attempts to enter the basement area. The new production line was put into service about two years ago; the complete line was supplied by the Vollert- Weckenmann group of companies. It is arranged around a large, cube-shaped curing chamber whose square base is about 20 m long and 10 m high. The chamber is heated to about approx. 40°C and provides 33 storage racks that can be fed from outside using a storage and retrieval unit. The access side of the chamber is somewhat reminiscent of a wall of bank deposit boxes designed for giants. The individual cells are arranged in three columns; each of these columns accommodates eleven cells. They can be accessed via individual flat-shaped, rectangular covers made of polished stainless steel. The opening of the cells can be likened to a moving game: The corresponding cover is lifted, and all closed units located above also move in upward direction. The unit located at the very top then simply projects from the curing chamber block. The centrally located curing space is also at the very heart of the logistics of the entire carousel line because unused pallets can be stowed away there, just like in a high-bay warehouse. The gaps in the production chain created by this arrangement make it possible to put individual pallets into parking positions or to move them back, and advance other pallets instead: As a result, pallets can easily overtake each other. “For the tilt table unit, we not only required an average skilled worker but basically a true all-rounder,” Dobler explains. “Appropriate qualification and training has always been an issue because people had been involved in all of the production steps right from the beginning. In contrast, the carousel line enabled us, for the first time, to create separate work groups for each manufacturing step. This has also made it much easier to train new people.” The company is placing great emphasis on training apprentices and offering them regular jobs upon completion of their training as far as reasonably possible. In addition, Nägele Bau’s approach is to provide all contracted services themselves instead of hiring subcontractors. This ‘one-stop shop’ philosophy and the high performance of the carousel line are best illustrated by a major project the business is currently working on: the production and assembly of the curtain facade for the new campus building of the University of Applied Sciences and Arts of Northwestern Switzerland at Brugg / Windisch. This facade consists of 2,500 elements made of architectural concrete. These items are still of a relatively reasonable size because they are no bulky hybrid elements that merge several facade segments in one large unit. Rather, separate elements are used for each post and beam of the facade. The individual items can be easily transported to the construction site using a 40-tonne truck, and lifted into their final position on the facade of the five-story building using a relatively compact mobile crane. It is also possible to produce more than ten of these elements on a single pallet. As on any other production line, an empty production pallet is provided at the outset. The central computer assigns a new, serial ID to it, which remains linked to the pallet until the end of the relevant cycle. The production process starts with the positioning of the formwork. Plastic-coated timber formwork is normally used, which is produced in-house at the joiner’s workshop. Workers on the shop floor fasten the vertical boundaries of the future element together with the required rails. In the next step, the pallet is lowered again, and a red enclosure mounted flush to the floor is raised, forming a guard rail. Looking through this rail, the observer recognizes how the pallet is moved underneath several work positions and stopped again underneath a similar opening. Appropriate mechanisms lift the pallet again, and it reappears in the assembly building where steel fixing teams start their work. To avoid dirt deposits, the subsequent concrete pouring does not take place directly above the floor opening but next to it. The pallet is moved into this position at ground level. The concrete is poured through a vectorial, swiveling casting unit, which is operated by a worker right next to it using a mobile control panel. Following concrete pouring, the pallet remains in its position and is subjected to vibration by a high-performance vibratory compaction system located underneath. In the final step, the steel table is moved into the curing chamber. The precast items are usually stored in the chamber overnight, and the formwork is stripped on the following day. Thereafter, the precast element and the pallet embark on separate routes. At this point, a tilting unit serves to raise the precast item. The compact elements for the Windisch site are simply lifted by a portal crane and put onto a carriage that transports them to the adjacent space for acid treatment. The empty table is then cleaned and labeled ‘free’. The facade elements produced for the project at Brugg / Windisch require a visual enhancement in order to make the material resemble quarry stone in terms of its color and surface texture. This effect is achieved by a chemical acid washing process applied to the surface, using the Microgel product supplied by Hebau in Sonthofen, Germany. Workers wearing respirators apply the jelly mass using special rubber wipers, spreading the material evenly on the precast product. The gel takes on an intense green color as a result of its chemical reaction with the alkaline cement paste. 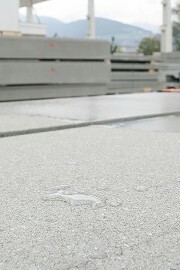 After about fifteen minutes, a second worker uses a water sprayer to remove the green jelly, and thoroughly cleans the precast element. A crane then lifts it into a dry position, where a third worker applies the protective surface finish. Marcus Herrfeld, of Hebau, stresses that the precast elements are not subjected to a hydrophobing treatment but impregnated. Although these treatments are very similar to each other, there is also a difference because hydrophobing would be more time-consuming. This process can be applied only after some time has passed following the pouring of the concrete. Although the agent penetrates the material much more deeply as a result of the more advanced drying process of the cement paste, hydrophobing would not lead to any significant benefits compared to impregnation. Whereas acid washing chemically triggers the final appearance of the precast element surface, the two processes mentioned above ensure that its quality is retained in the long term. A truckload is transported from the Röthis factory in Austria to the construction site at Windisch, Switzerland, almost every day. A team of in-house fitters assembles the precast elements just in time on the job site. Contrary to other projects of this size, the workers erecting the facade are not moving around the shell of the building from one story to the next but complete the individual sides of the facade one after another. The corner posts must thus be assembled with a particularly high degree of precision, requiring tolerances of less than 1 mm. Otherwise, assembly imprecisions would add up to major deviations that could no longer be corrected. 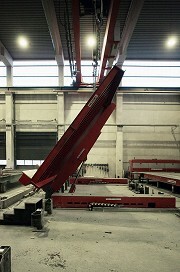 In the long term, Nägele Bau intends to focus its activity on the production of precast architectural concrete elements. As a matter of course, the business also envisages a presence in Germany in this segment. In this part of the market, the company considers itself competitive to German producers because the prices to be paid for such elements are still viable. Martin Dobler sees an opportunity rather than a challenge in meeting the significantly more stringent quality requirements, such as in terms of color, surface texture and precision.